Anubis, after being nowhere in sight for hours, decided that I should not be allowed to write my poetic entry for the monthly writing contest over at Devin’s Forum. I wrote five lines and then there was cat and smeared ink with paw prints. I did manage to free the pen but he decided it was a good time to play with said pen. Anubis likes that pens roll with little effort so he “hunts” them. When I cleaned the office during this past week, I found around twenty pens under the desks, bookcases, and the sofa. 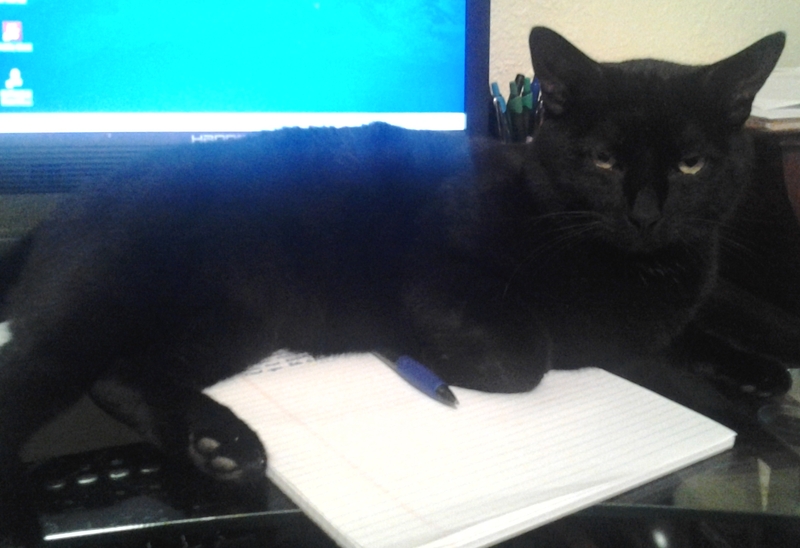 I was eventually able to continue writing, with him using the notepad as a bed, but he kept trying to eat the end of the pen. I gave in after few more lines and petted him until something else warranted his attention resulting in his departure. The poem is now done and sent on its way but paw prints in smeared gel ink never fade.